A concise primer on the beauty of voluntary exchange. 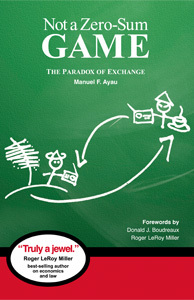 Whether between next door neighbors or strangers across the sea, trade makes both parties better off and Manuel Ayau does a magnificent job explaining how. Mary Anastasia O’Grady The Wall Street Journal.